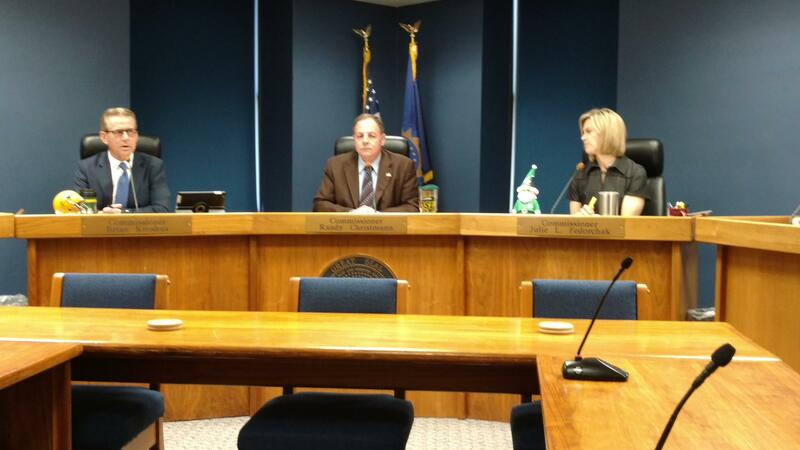 Public Service Commissioners Brian Kroshus (i); Chairman Randy Christmann; and Julie Fedorchak. The Public Service Commission has decided that Dakota Valley Electric Cooperative will provide power to a new grain handling facility being built near Mooreton in Richland County. Minn-Kota Ag products is building that plant. It will process 20,000 bushels of grain per hour, and has a storage capacity of 3 million bushels. It is scheduled to go on-line in June. Minn-Kota had wanted Otter Tail Power Company to provide electricity to the new plant. But Dakota Valley objected, because the plant is in its service area. Commissioner Brian Kroshus said although Minn-Kota preferred Otter Tail as its provider, that’s only one of the issues the PSC considers when deciding who will get to serve a customer. "In my opinion, Dakota Valley is better equipped to serve the area with orderly development," Kroshus said. "Otter Tail's application would result in wasteful duplication." "During the hearing, Otter Tail testified it was going to develop a substation and a line to serve the customer," said Commissioner Julie Fedorchak. "They said, quite honestly, they did not intend to serve anybody else from that at any time. That seems to me to be duplication." The company said it asked for Otter Tail because Dakota Valley serves an existing facility near Wahpeton, and there had been some problems. But the PSC said the co-op has pledged reliability.